Juan Martin del Potro of Argentina, reacts after winning the second set against Borna Coric of Croatia, during the fourth round of the U.S. Open tennis tournament in New York on Sunday. 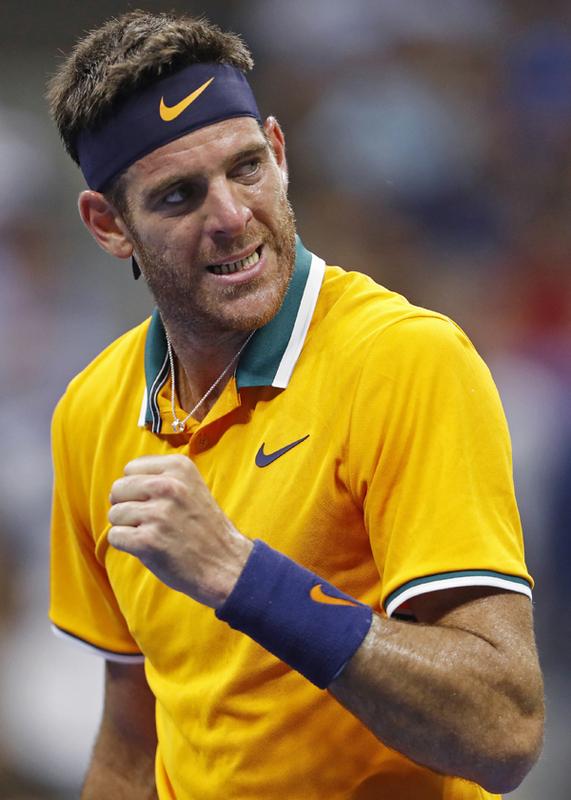 Former champion Juan Martin del Potro cruised into the quarter-finals of the US Open on Sunday with a 6-4, 6-3, 6-1 victory over Croatia's Borna Coric. The third-seeded Argentine, who lifted the trophy in Flushing Meadows in 2009, is in the quarter-finals for a third straight year and sixth time overall, reaching the last eight without dropping a set. Del Potro broke Coric in the final game of the opening set, and from there he was in control in a match again played to the accompaniment of cheers and chants from a group of del Potro's friends who made the trip from Tandil to watch him. Coric, the 21-year-old 20th seed, sought treatment for a right thigh problem late in the second set and never threatened in the third. Del Potro wrapped it up after two hours and five minutes with his sixth service break of the match when Coric smacked a forehand into the net.